I recently got asked about eating vegan and low carb – I have written about this in my ebook HERE along with some more vegan nutrition (i.e a whole lot of pages!) as well as recipes. So I highly recommend you buy that ebook if you are interested in vegan nutrition and how to get all the vitamins and minerals on a vegan diet, or just to try some tasty recipes. I have also writtena post about “not wanting to eat vegan because it is high in carbs” HERE. I often get people in recovery saying that they are scared to eat vegan because it is often higher in carbohydrates compared to an omnivorous diet which consists of a lot of meat and dairy products. Post about carbohydrates HERE and why we need them. If I ask someone whether they think beans and lentils are a carbohydrate or a protein source I get very mixed results and usually 50/50. But the fact is, lentils, beans, quinoa are both protein and a carb source. As a vegan, if you want to eat more protein you will automatically eat more carbohydrates as well because most vegan protein sources are also a source of carbs. Let’s begin with carbohydrates… I know media has brainwashed us to think that carbohydrates are bad, but they aren’t. 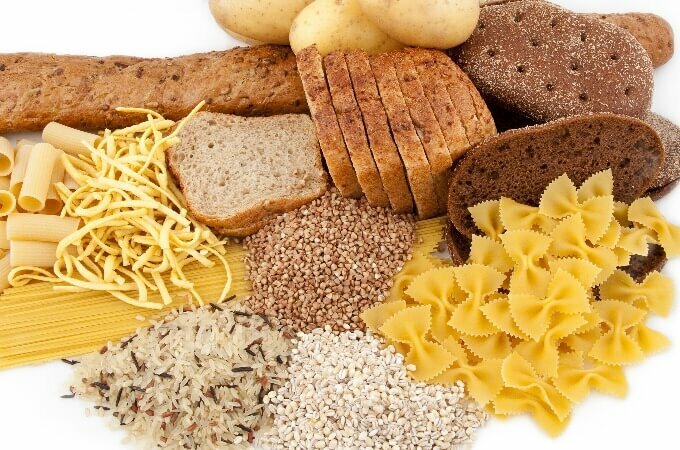 They are the bodies primary source of energy and easiest source of energy… so yes, you need carbohydrates every day. Of course, only eating carbohydrates or lots of refined carbohydrates isn’t recommended… you also need essential fatty acids and protein. You can of course eat low carb as a vegan, but it isn’t the easiest and isn’t recommended. If you want to eat low carb as a vegan then eating a lot of tofu as your protein source is a good idea as it is low carb and high protein. And eating more fresh vegetables or vegetables such as broccoli and cauliflower and spinach and kale etc which are lower carb. Potatoes are also a great energy and carbohydrate source, and even quinoa is a source of essential amino acids as well as carbohydrates… so you could eat just salad with quinoa and avocado and (maybe some extra tofu) then you would get a complete protein source, carbohdyrates and healthy fats. Other options are edmame beans which are low in carbs and high in protein. Other meal ideas are scrambled tofu with chickpeas or black beans with salad (also I would recommend adding some bread with the meal to make it more carbohydrate rich as well as complementing the beans and flour to form a complete protein source!). It is up to you if you want to classify beans and lentils and grains as your carbohydrate source or your protein source…. For me, I see them as both. I don’t think about macronutrients when I eat… I just eat what I am craving i.e somedays I eat just potatoes and avocados for a meal and other days I eat just tofu and beans and call it a meal. But most often I have a bunch of different ingredients in a bowl so I get all the nutrients and macronutrients in a meal and I don’t think about the protein, carb or fat content in my meal. Carbs aren’t bad and you don’t need to restrict your carbs. However, if you feel that you are just eating potatoes and beans and lentils then maybe add more tofu, tempeh or soya products to your diet. Maybe even substitute for some more health fats such as avocado, seeds and nuts or make a sauce with soya yoghurt or oat crème fraiche. I am not so sure how great I have answered this question…. But know that yes, you can eat both potatoes and beans in a meal and it doesn’t have to be too many carbs. Also note, that protein deficiency as a vegan will only really happen if you eat far too little calories or mostly eat rice/bananas/only potatoes. But if you eat varied and eat a bunch of beans and grains and lentils then you will get enough protein – as well as eating nuts, seeds, tofu, tempeh or soy products which have protein! Don’t forget that bean pasta, oats, quinoa, grains are all a great source of protein as a vegan! Also it can be harder to feel satisfied or get enough energy if you aren’t eating alot of carbohydrates. Carbs that come from beans, grains, legumes, vegetables are also a source of vitamins, minerals and antioxidants that you need. So as long as you choose mostly whole grains and root vegetables as your carbohydrate source (i.e not just white rice, white bread and white pasta) then there is nothing to worry about! Post: not feeling satisfied on a vegan diet. Why should I avoid eating mostly white rice, bread and pasta as my carb source? Is it dangerous? Of course not 🙂 if you enjoy those foods eat them! Pingback: Keto diet – what is it? Can you eat LCHF and vegan?